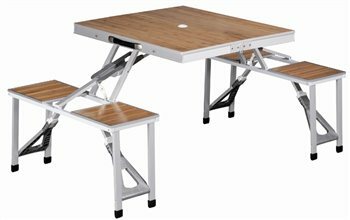 The Outwell Dawson Picnic Table is a superb folding table and chair set; its modern design combines Aluminium and Bamboo to create an aesthetically pleasing design. This table and chair set will seat up to four people comfortably and provide ample space for eating, playing games while away on a camping holiday, or relaxing at in an evening. Outwell’s Dawson folding picnic table would be perfect for a camping holiday, picnic or for use at home in the garden. Elegant bamboo table - combination of natural beauty and modern design – your neighbour at the campsite will envy you. The portable table is compact and easy to carry yet very stable when opened. For picnic or camping the table fulfils your needs. This picnic table is substantially better than the cheaper plastic equivalents, in my opinion. It feels much more sturdy to sit on, and the bamboo panels in the table and seats look really smart. It is quite heavy to carry, but is simple to erect, and plenty of room for a family of four to eat or play games. Given the size of this table, it is impressively sturdy and versatile. It's sort of wiggly, so it's definitely for sitting still for shorter periods of time. And don't sit on the table :) Compared to more plastic-y versions of these (I own one) the build quality of this one is quite nice. Recommended. A little bit on the expensive side but really worth it thanks to an exellent make and finish. Much nicer than the plastic versions and feels solid to sit on. Heavier but this is a result of being better built than the rest. Real wood is lovely too. Light weight, easy mounting and very safe and sound to use for kids or adults.